How do you cope with stupidly low speed limits, endless semi-trailers choking the two right lanes (even if there are only two), and drivers who seem to think that, because they're from the Centre of the Universe™, they have a right to drive as moronically and/or in others' faces as they want? Oh, and how about the endless signs peppered over the roadsides cajoling you how to drive, how to live, how to do everything except drive distracted (because it appears to only be okay when it's the government doing the distracting)? Well, you could try driving in a Lincoln. It won't make the drive better, but it can certainly make it a lot more pleasant. This was the situation my dear wife and I found ourselves in during a two-week jaunt to southern Ontario, driving from Toronto to Ottawa, to Toronto, to Leamington, to Toronto, to Ajax, to Canadian Tire Motorsport Park and back to Ajax (twice) and, finally, back to Toronto. It was my annual trip to AJAC's Canadian Car of the Year TestFest, tripled with a visit to my elderly Dad in Ottawa and a family wedding in the Leamington area. I find driving in Ontario to be particularly unpleasant. I'd rather be stuck behind traffic on the twisty Trans Canada highway through the B.C. interior than spend any time on highway 401, the "freeway" that stretches from Quebec to Windsor. It's a road on which it appears the government has unleashed everyone who failed a driver's test and left them to bounce off the big trucks that clog the roadway, all with a ridiculous divided highway speed limit of 100 km/h. 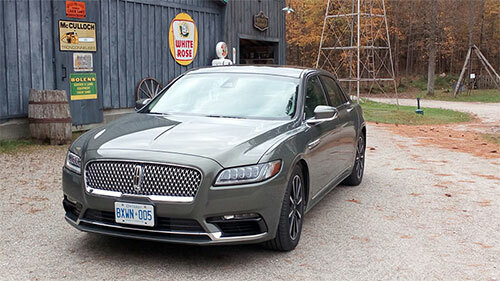 Fortunately, the folks at Lincoln Canada offered me a Continental to use for our trip and, since I'd driven one and liked it far more than I expected to back in February, I jumped at the chance. So it was we picked up a well-used 2017 Continental Reserve AWD and headed toward the Nation's capital for the first leg of our motoring marathon. I looked forward to the Lincoln because, while Southern Ontario is a pretty boring place to drive generally, particularly the southwest section (I've joked that if it weren't for the curve of the earth you could see from London to Windsor), but we were heading first to where there are some particularly nice back roads and, despite the idiotic 80 km/h speed limit, they can offer a car guy some interesting experiences. And we put some of them to good use. The Continental, once I'd ordered its suspension to default to the sport setting permanently, was more than up to the task. Lincoln Canada's sample came with the optional ($3,000 CAD) three litre twin turbo V6 that cranks out a lovely 400/400 horses/torque as well as offering dynamic torque vectoring (handy on the twisties!). This made it nearly ideal (it's great, but it still isn't a sports sedan) for the trip from Kingston to Perth along highway 10, through Inverary and Bedford Mills to the lovely town of Westport. If there's no traffic, you can have a ball on this road, which features plenty of tight curves and small hills, and that's what happened on this trip. The Continental could be a little tighter in its handling and suspension, but for a big luxury car it did a fine job. In its sportiest settings, it drives smaller than it really is. I like that. The Continental is not only a good performer, though; it's also quiet and luxurious - but what really turned my crank about this car both in this trip and my initial week with it was its exquisite interior design. Lincoln's designers have given its owners a lovely interior that's state of the art, yet doesn't require you to go back to school to figure out how to operate it. The interfaces are thought out and executed so well I hope it trickles down to the rest of the Ford/Lincoln line, which could use some interior simplification. I also hope other manufacturers are watching. The seats are first rate as well, though in this sample the front seats were showing signs of wear. That seemed a tad weird since the sample only had about 20,000 km on it, though since it was a media car they were undoubtedly harder kilometres than the average Continental buyer might inflict on it. I know I did my part! The Continental also featured a nice massaging feature that came in handy on our longer drives - and which I missed when we switched to the MKC for the second leg of our trip. Lincoln's sample also came with about 15 grand worth of options above its $60,500 base price (which I find quite reasonable considering what you get). The options included the "big" engine ($3,000), the $5,500 Luxury package (cool LED headlights, and the Revel Ultima audio system with single disc CD player), $750 extra for the great seats, and three grand for the Technology package (auto dimming rear view mirror, active park assist, adaptive cruise control - which was very handy on 401 - pre-collision assist with pedestrian detection, a 360 degree camera and shut-offable lane departure warning). The total bill came to $75,050. Our travels took us through the Gatineau hills (to take in the leaves' fall colours), Wheeler's Pancake House near McDonalds Corners (a great lunch, via a lovely, quiet and twisty back road) and a few other places that exploited the Continental's goodness very well. It was a comfortable yet rewarding drive, a fine choice of vehicle for such a trip. Well, nearly. Shortly after crossing the event horizon that helps keep the Greater Toronto Area from infecting the rest of the nation, the Continental's check engine light came on. This is often indicative of a minor issue, but since we were on the road in the middle of nowhere (and with no code reader handy, since I'd left mine at home) it caused a certain amount of angst. It went off again, then came on again, sometimes flashing, just enough to make me paranoid. And that's how we got into the MKC small crossover for the second leg of our journey. Meanwhile, we got lots of admiring looks and even some comments about the stately Continental. Once, at a gas station, the attendant made a point of telling us how cool the "trim-mounted" exterior door handles are. That prompted me to show him the inside door handles - which aren't door handles at all but rather are buttons on the armrest; you just press the button and push open the door. It's a great feature - so much so that I spent the entire second week in the MKC reaching for them even though the MKC's door handles are conventional and mounted higher. There's even a manual backup system you can use to open the door in case the car loses electrical power - or if the check engine light means you're in real trouble (to be honest, we never had any trouble other than the light, but never let it be said I let a chance to be snarky go by). One thing this sample didn't have was the optional rear seat entertainment system that hides in the fold down armrest back there, and which is quite cool, but to be honest we didn't miss it even though my wife spent quite a bit of time back there. Despite the check engine light and the wear on the seats, our time with the Continental was pleasant and rewarding. I really do like this car, even though it's bigger than I'd likely choose to buy. But shrink it down to about the size of the current MKZ and they'd really have something (not that the MKZ isn't a nice car, but a "mini-Continental" like this would be terrific). Lincoln let us swap the illuminating Continental for an MKC for the second week, when we crossed through the black hole again, and as much as I was disappointed having to give up the Continental, the MKC was a good choice for replacement. As an SUV, it offers a taller seating position - which is nice in traffic - as well as being a vehicle that drives very nicely while coddling its occupants well. Sure, it's a gussied up Escape, but it's gussied up very nicely! It's nicer to look at, nicer to be in, and more exclusive than the nearly ubiquitous Escape. Lincoln Canada's sample MKC carried a starting price of $48,300 CAD, but it also came with $700 worth of paint (Burgundy Velvet) and ebony premium leather trim. It also had aluminum trim ($225), Class II trailer towing package ($500) and the $2250 Technology Package (active park assist, adaptive cruise, lane keeping system, etc. ), causing it to tip the vehicular money scale at $52,075. That's a lot of loot for an Escape, but the MKC doesn't really feel that much like an Escape and I don't think it's overpriced considering that competitors such as the Lexus NX, Audi Q5, BMW X3 and the like will run you about the same, depending on how they're configured. The MKC gets its power from a two litre inline four cylinder engine that's rated at 240 horses @ 5,500 rpm and 270 "torque-like substances" @ 3,000 rpm, though a more powerful, 2.3 litre engine is available as an option. The base engine is smooth and there's plenty of power, and - surprisingly - I didn't really find myself wanting more oomph, at least on those flat and straight roads. Power goes to all four wheels via a six speed automatic, with paddles, that shifts nicely. As is usual for me, I kept the MKC's chassis in Sport mode, which tightens up the vehicle's responses and adds a nice helping of driving enjoyment while not sacrificing much in the way of cushiness. 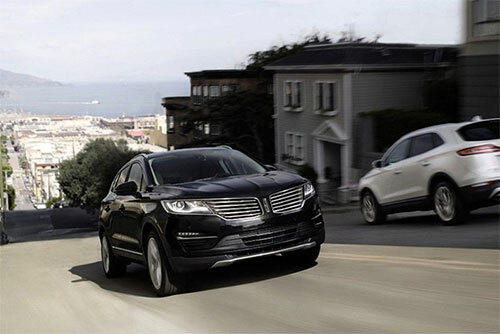 Both Lincolns feature the much improved Sync 3 infotainment system, which features simpler menus, works more quickly, and seems to have better voice recognition than before. I missed the Continental's steering wheel control design because the MKC still offers the older cascading menu system and I don't like it as much because it takes more concentration. I really liked the big, panoramic sunroof both vehicles had, though. I definitely preferred the Continental to the MKC, but either of these vehicles could do a fine job of bearing you across the miles. Just put a piece of black tape on the instrument panel to block out the check engine light if it comes on.